Welcome to my new weekly post on our little guy! 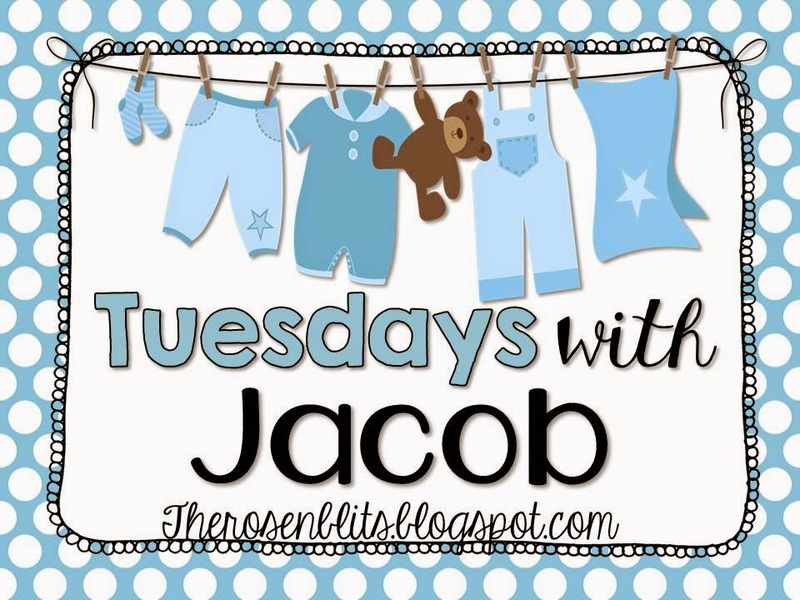 His very first Tuesday was covered in his birth story here. By the end of this post you'll see why this week's update is being published late.... we were a little busy on Tuesday. Tuesday afternoon once Jake was cleaned off, fed, and Mommy had used the bathroom, Jake's Pop-pop and grandma Linda stopped by with lunch. Mommy was starving and ate that yummy club sandwich so fast!! Once the epidural had worn off and Mommy was stable we moved to Post Partum room #15. Later that night Grandma Kayla flew in from Michigan to meet you! We spent the next two days of Jake's life in the hospital getting to know him and introducing him to our families. The first night went nice and smooth. The second, not so much. Jake started cluster feeding since my milk wasn't in yet and cried and nursed all night long. He was only happy when Daddy was rocking him, or when Mommy was feeding him. The hospital also did a hearing test which he passed with flying colors, and the photographer stopped in to take some pictures. Wednesday afternoon we moved to room #24 since they needed to do some work on our room. Our third room in three days! On Thursday afternoon we got to go home! We were so excited to bring our baby home! Our dogs were super excited and hyper but they quickly calmed down and have been VERY good doggies ever since. Later that Day papa showed up! We spent the rest of Thursday and Friday at home loving on our little guy. Those first few nights at home were rough! Jake was still cluster feeding and cried/nursed almost all night for two nights. On Saturday we went for his first Doctors appointment with the on-call nurse practitioner. Little guy was looking a little jaundiced and had lost almost a pound off his birth weight so we were told to start supplementing with some formula after each feeding and to check back in with our pediatrician on Monday. Little Guy also went on his first outing on Saturday. Grandma switched our family plan to T-Mobile so we had to go update Mommy's line and get her a new phone! We were gone almost two hours and little guy slept the whole time! On Sunday we celebrated Father's Day! It was Daddy's First! Pop-Pop and Grandma Linda came over too. We made steaks and potatoes for dinner and had Key Lime Pie for Dessert! On Monday we went to the Pediatrician who took a bilirubin level to check little guy's jaundice levels. He thought his color looked good and didn't think there was too much to worry about. Around 9:30 that night he called and said that Jake's levels were through the roof and we needed to be admitted to the hospital right away. We took little guy to the ER where they admitted him, took another bilirubin level and put him under phototherapy lights right away. His bilirubin level 24 which is considered very high. As soon as a spot was secured they moved him upstairs to the NICU where he had his own little room since he had come in from home (the other babies were born there and never left). Mommy was so worried, but thankfully she got to stay in a hospital room nearby so she could pump fresh milk for him and check on him throughout the night. Daddy had to work the next day and had to go home, so Grandma stayed with me. The nurses in the NICU were so nice and reassuring. They made our stay there so much better! And thus ended our first week with Jacob. A little scary, a little stressful, but wonderful just the same. 39 Weeks: Welcome to the World!